A wood deck requires regular maintenance just like any other major part of a home. Regular cleaning and application of a high-quality stain and sealer will help protect your deck from the weather and ultra-violet ray damage caused by the sun and will extend the usable life of the deck. Remove all debris trapped between deck boards and the edge of the house and sweep or blow the deck to remove all debris. For mild stains and dirt use a mild dish detergent diluted in a bucket of water. Mop a small area of the deck surface with the detergent and then use a stiff bristle brush to work the dirt free from the surface. Rinse the solution with a garden hose and re-clean areas as needed. Unless directed otherwise by the manufacturer, apply the cleaner only to the amount of deck surface you can work at one time. Work in sections and let the deck cleaner do its work. Many cleaning solutions should not be allowed to dry on the wood so periodic spraying/misting may be required. Rinse well with water and repeat the process on the next section of the deck. Once cleaning is completed inspect your work. The surface should be consistently clean and unmarred or damaged. Re-clean any stubborn areas that still look dirty. 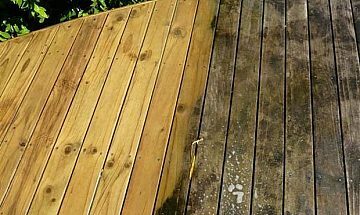 Many homeowners want to use a power washer to clean decks but, without appropriate care, it is easy to ruin the deck surface and cause significant damage to the wood. Be especially careful power washing newer deck surfaces that have not been previously sealed or coated. If you do choose to use a power washer pay careful attention to the manufacturer’s instructions. In addition, these general recommendations obtained from various online sources may be helpful. Never use a narrow stream or a rotating “tornado” type of tip. As you sweep the sprayer along the deck boards, many people will have a tendency to pivot their arm and that will create an inconsistent distance of the tip from the deck surface. Try to maintain a consistent distance from each deck board as you clean. You can do this by walking slowly and holding the sprayer steady at a level distance and angle. Mold and mildew are present everywhere in our environment, both indoors and outdoors. Mold and mildew need four things to thrive: air, water, temperatures between 32 and 120F, and a food source-- conditions that are common wherever humans live, work, and play. The best way to minimize mold and mildew growth is to control water and food sources. When it comes to mold or mildew on wood decking, water, and organic matter are the primary conditions that enable mold and mildew colonies to thrive. To minimize these conditions, make sure water has the ability to flow away from the deck surface and areas surrounding the deck to lessen the absorption of water. 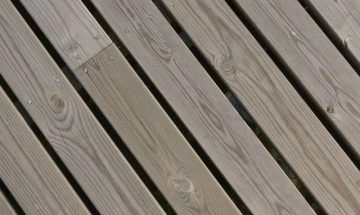 Ensure there is adequate ventilation between deck boards and underneath the deck surface, so water can rapidly evaporate. And since both mold and mildew feed on dead or decaying organic matter, it is important to keep your deck clean of leaves and debris. A deck is a special part of your outdoor living space that should last for years. Keep it looking its best with the right deck cleaners, sealers and stains to enhance its long-term beauty. You can stain treated lumber when it is dry. Test the wood with a few drops of water to see if the wood is dry enough to readily absorb the water. Apply the stain to a small portion of the deck to ensure the wood is sufficiently dry. As soon as the wood is porous enough to accept the stain, it is ready to stain. Apply a high-quality oil or water-based finish with UV protection to slow down the process of wood turning gray from exposure to the sun. Apply a water repellent sealer at least every two years. Always follow the manufacturer’s recommendations for new and re-application. Wear appropriate safety protection when working with treated wood products including gloves, goggles and dust mask. Do not burn pressure-treated wood or use treated wood debris as mulch. Pressure-treated wood should not be used where it may come into direct or indirect contact with drinking water or a component of food, animal feed or beehives. Dispose of treated wood debris in accordance with local regulations.